Have you tried online yoga yet? 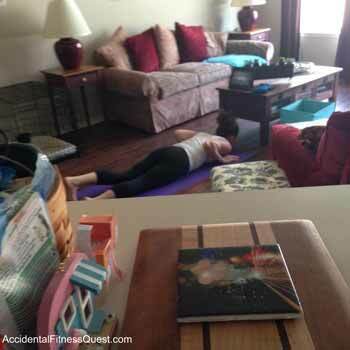 You are here: Home / Workouts / Have you tried online yoga yet? Throughout my Fitness Quest, I’ve periodically given yoga a try. My Mom is a yoga teacher and has always talked about the benefits of it. Usually with some eye rolling from me. The first few times I tried it, I honestly didn’t really like it. I’m a Type A and it didn’t suit my personality. There was no real calorie burn involved. I couldn’t get my mind to relax. Heck, I couldn’t get my body to relax. For some strange reason a couple years ago, I joined a local hot yoga studio and I went faithfully a couple times a week for about 4 months or so. Then they started this huge construction project in the area, traffic got insane and I found myself missing classes and not being able to find a time that worked for a replacement. It was around that time that I found YogaDownload.com..
YogaDownload offers a bunch of yoga classes of all different types, fitness levels, and class lengths. After trying out a bunch of their free classes, I decided to treat myself to an annual membership. It was so cheap that I figured even if I only used it every now and then, it wouldn’t break the bank. Since there weren’t any schedules to coordinate, it was much easier to squeeze classes in. If I was bored, I could pick a class. If I was feeling sore, I could pick a relaxing class. There are tons of different types of yoga from relaxing to hard to balance challenging to mentally challenging. With someone else picking the class for me, I tried types of yoga that I never would have picked otherwise. This got me outside my comfort zone and trying new things. Yoga actually eased a lot of the muscle soreness that I usually have after lifting weights. It even worked better than foam rolling which I do often, and it was much more affordable than getting a massage. The audio only classes really helped me learn to listen and follow form instructions. Without having a visual to follow, I really had to concentrate on what I was being told to do. I couldn’t let my mind drift off or I’d have no clue where my hands, feet and other parts were supposed to go. There were quite a few poses that I couldn’t do but they had plenty of modification suggestions. Instead of just sitting it out, I tried to modify and surprised myself. I decided to find ways to modify some of my workouts in the gym so that I could work my way up to some new things. By holding poses and listening to verbal cues from the instructors, I found myself able to concentrate and really feel the muscles that were supposed to be working. This was probably the most beneficial of all to my lifting. It greatly enhanced that mind muscle connection that you hear people talk about. I could tell while lifting if I was feeling it in the correct muscle or not, and adjust when needed. During the month of May, YogaDownload is having a sale on their yearly Elite Membership which is the membership that I have. Through May 31, 2014, the Yearly Elite Membership is only $60 (instead of the regular price of $90). When you sign up, you get locked in at the discounted price for the life of your membership too. This is a really good deal considering all that you get and that you don’t even need to leave your house. If you’re interested, give their free classes a try before you buy a membership. They have quite an extensive free selection to choose from. Disclaimer: If you sign up through the links on this page, I get a small percentage of your membership fee. You are welcome to go directly to their site and get a free membership or to sign up for any of their various options. You do not have to sign up through my link.